New line gives dealers the option to install an outdoor subwoofer either in-ground or above-ground, expanding placement options. AMSTERDAM, NETHERLANDS — Providing dealers with versatile audio solutions that meet real world installation challenges, Nortek Security & Control LLC (NSC) today announced that it is now demoing the new SpeakerCraft® Terrazza™ Series Landscape Speaker System at ISE 2019 in Nortek Security & Control Stand 1-N50. Consisting of four SpeakerCraft Landscape Satellite Speakers and either a traditional in-ground Subwoofer or a brand new above-ground Hardscape Subwoofer, the multi-speaker solution allows dealers to create a 360-degree outdoor sound experience. Optimal for installations in which in-ground installation isn’t possible, the all-new SpeakerCraft® 8” Hardscape Subwoofer features an ultra-waterproof rotational molded Polyethylene enclosure and a high excursion 8” DVC woofer with rubber surround. Equipped with a 1m burial-rated speaker wire, silicone-filled wire nuts, a rust-resistant aluminum grille, and a key-way mounting to secure to the hardscape surface fastening points (with optional tent stakes), the subwoofer is both sturdy and secure. For installations that allow for in-ground installation, the traditional 8” SpeakerCraft Burial Subwoofer also leverages an ultra-waterproof rotational molded Polyethylene enclosure and a high excursion 8” DVC woofer with rubber surround for performance and durability. The low-noise Canopy/Reflector with UV resistant paint helps it easily blend into the outdoor surrounding. It also includes a high Excursion 8” DVC woofer with rubber surround, and allows for 2nd order crossover on both channels. 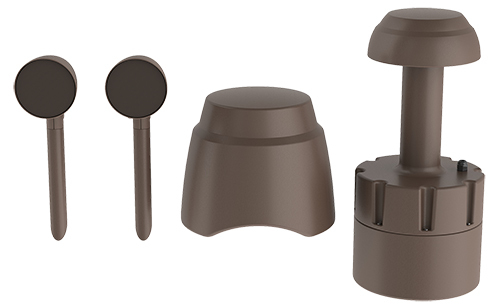 Additionally, the Landscape Satellite Speakers’ ‘Pivot and Rotate + Quick Connect Stake’ allows for easier outdoor speaker installation than ever before. “All satellite speakers in the system feature a tool-less ‘quick connect’ installation method that allows the stake to be knocked into the ground to the desired depth, then attached to the speaker without the need of rotation or threading — which can bind the wires and cause failures,” Zaliauskas explained. Unlike high performance landscape systems that require expensive high-power amplifiers, the new SpeakerCraft® Terrazza Landscape Series System is designed to be used with lower powered distributed audio amplifiers or extended audio zones (like Zone 2) from conventional AVRs. The system can be expanded to up to an 8.2 system, and integrators have the option to purchase 2.0 speaker expansion kits for the system. The new Terrazza™ line will ship in March 2019. To hear the new Terrazza™ system, visit Nortek Security & Control at Stand 1-N50. SpeakerCraft, now part of Nortek Security & Control LLC, combines premier audio with designer aesthetics to fill the home with music and audio enjoyment inside and out. Internationally recognized for innovation in architectural loudspeakers, SpeakerCraft is distributed through a comprehensive channel of select dealers throughout the United States, Canada and countries worldwide. Nortek Security & Control LLC (NSC) is a global leader in smart connected devices and systems for residential, security, access control, and digital health markets. NSC and its partners have deployed more than 4 million connected systems and over 25 million security and home control sensors and peripherals. Through its family of brands including 2GIG®, ELAN®, Linear®, GoControl®, Mighty Mule®, IntelliVision®, and Numera®, NSC designs solutions for security dealers, technology integrators, national telecoms, big box retailers, OEM partners, service providers, and consumers. Headquartered in Carlsbad, California, NSC has over 50 years of innovation and is dedicated to addressing the lifestyle and business needs of millions of customers every day. For further information, visit www.nortekcontrol.com.